Laminated and tinted deck patch with squegeed colour with black resin pinlines. Post production leg rope plug - right. 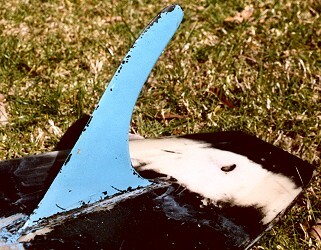 This is the original fin but it has probably been damaged and shortened. Boat matting repairs to front of the fin base. Original clear botom, black and blue paint layers. Offset right at forward sweet spot. 8384 -pencil at pod, see image below right..
Clear with 2'' Volan overlaps, laminated and yellow tinted deck patch with red and green squegeed colour, black pinlines. Bottom : Clear with 2'' Volan overlaps ??? Board submitted, with thanks, by Bob Munroe, Gerroa, NSW. Although the deck was in good condition (protected by wax), the bottom and rails have some damage that has mostly been poorly repaired. The botom and rail laps had been painted with black and then blue paint. A quick search on the bottom found the pencil marks. No bottom decal or other decor was found. See Pintail #96 Roundtail #171 and Tracker #108 The three models were illustrated late1968 / early 1969. 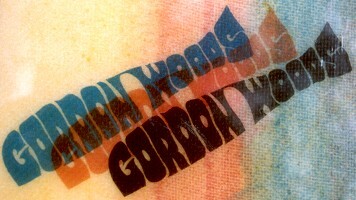 Image courtesy of Gordon Woods Archives. Originally printed in Surfing World Volume 12 No. 1 1969. COMMENTS: Note advanced fin placement. Surfing World Volume 12 No. 1 1969. See advertisment above.